Includes the names: Anna Zegers, Anna Zegers, Anna Seghers, Anna Seghers, Anna Seghers, Anna Seghers, אנה זגרס, Netty (Anna Seghers) Reiling, Анна Зегерс, псевд. Anna Seghers, née Reiling, was born to a German Jewish family in Mais. Her father Isidor Reiling was an antiquarian and art dealer and her mother Hedwig Fuld came from a very wealthy Frankfurt family. She studied subjects as diverse as history, literature, and Chinese at the Universities of Cologne and Heidelberg, earning a doctorate in art history. She became serious about writing during her last year at university and in late 1924 published her first story, "Die Toten auf der Insel Djal" (The Dead on the Island of Djal). 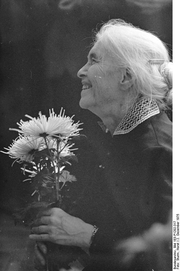 In 1925, she married Laszlo Rádványi, also known as Johann Lorenz Schmidt, a Hungarian Jewish Communist and teacher, with whom she had two children, and went to live in Berlin. She joined the German Communist Party in 1928. Her first novel, Die Gefährten, published in 1932, was a warning against the dangers of fascism, which led to her being arrested by the Nazis. By 1934, she had gone into exile via Zurich to Paris. After Germany invaded France during World War II, she fled to Marseilles and a year later to Mexico, where she founded the anti-fascist Heinrich-Heine-Klub, named after the poet, and Freies Deutschland (Free Germany), an academic journal. In 1939, she published The Seventh Cross, for which she received the Büchner-Prize in 1947. It was published in the USA in 1942 and adapted into a Hillywood film in 1944. The Seventh Cross was one of the very few depictions of Nazi concentration camps, in either literature or the cinema, during World War II. Her best-known story was "The Outing of the Dead Girls" (1946), an autobiographical reminiscence of a pre-World War I school excursion on the Rhine. After the war, she returned to Germany, eventually settling in East Berlin. Anna Seghers is currently considered a "single author." If one or more works are by a distinct, homonymous authors, go ahead and split the author. Anna Seghers is composed of 10 names. You can examine and separate out names.